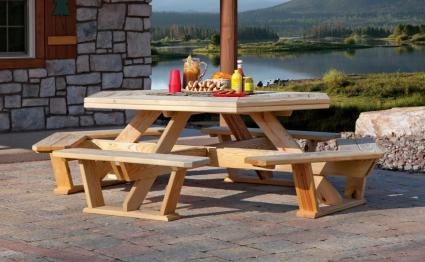 Since 1974 King Tables has been making simple, rugged and well-built wood outdoor furnishings. People appreciate the solid construction, practicality and comfort they provide. King Outdoor Furniture is made to last for years, making it a smart buy for everyone concerned with getting a good value. Quality workmanship and "hands-on" management are keys to bringing you good products. We keep our customers in mind with every step of our manufacturing process. The result is an increasingly large selection of quality products, and timely availability of every item in our line. We use stainless steel screws on all products.